AMAZON’S NEW HIRE SUGGESTS A FURTHER MOVE INTO THE MEDICAL RECORDS MARKET: Last week, Amazon hired former FDA chief health informatics officer Taha Kass-Hout, who will join the company’s secretive 1492 health lab, according to CNBC. The secret lab is reportedly investigating several areas of healthcare, including medical software and hardware, delivering and selling pharmaceuticals, and opportunities that involve pushing and pulling data from legacy electronic health record (EHR) systems. While it’s unknown what Kass-Hout will be working on, it’s likely going to focus on developing improvements in EHR interoperability, CNBC notes. Kass-Hout’s expertise is in health IT and navigating government health regulation. Most recently, Kass-Hout worked at Trinity Health as a senior VP overseeing data, analytics, and digital health initiatives. Bringing more business to Amazon’s behemoth cloud business. Healthcare networks, systems, and enterprises are eager to utilise cloud companies’ computing power to analyse and make meaningful inferences from the troves of EHR data stored in servers. Kass-Hout’s experience in understanding the ins-and-outs of moving patient data and working with government regulations could help Amazon become even more appealing to potential customers. Moreover, this isn’t new territory for Amazon. The company recently partnered with Cerner – a giant in the EHR industry, generating about $US5 billion in annual sales and controlling a quarter of the EHR market. Making Alexa an EHR access point. Amazon has been improving the healthcare-aspect its voice assistant platform, adding capabilities like reminders, which can be used to help coordinate timing for taking medications. The company could be looking at making Alexa an EHR access point for users allowing them to more easily retrieve EHR information over voice, such as health benefit plans and lab results. Another option is to deploy Alexa as a clinical decision support resource for medical staff, retrieving patient files and EHR info for medical staff. Providing better targeting for Amazon’s online store. The company began selling medical equipment and over-the-counter drugs via its Basic Care line in August 2017. Having more information about a consumer’s medical history – with their permission – would help Amazon better target their customers and could be further bolstered through Prime discounts. Amazon isn’t the first tech company to explore making EHRs more accessible, but its new joint healthcare venture with Berkshire and JPMorgan gives it a leg up over others. These companies are uniquely positioned to test out the best practices for making EHRs fully-interoperable: Each firm already has several health initiatives linked to patient records. Chase offers payment processing services for both providers and payers, Berkshire offers healthcare liability insurance to providers through MedPro Group, and Amazon can lean on AWS’ healthcare-specific cloud solutions. The partnership means the companies will be able to work together to explore best practices for deep EHR integration. HOME-GENETICS TESTING COMPANY ADDS TESTS FOR HEART CONDITIONS: Colour, a home-genetics testing company best-known for its DNA test for certain types of cancer, launched a new kit that can detect predispositions to various inherited heart conditions, according to TechCrunch. The test analyses users’ saliva, seeking mutations in 30 genes that indicate hereditary heart conditions. If a mutation is detected, the user is flagged as having a potential higher-risk of developing the disease and directed to follow up with clinicians for next steps. Home-genetic tests are becoming increasingly popular as consumers look for more convenient ways to manage and monitor their health. 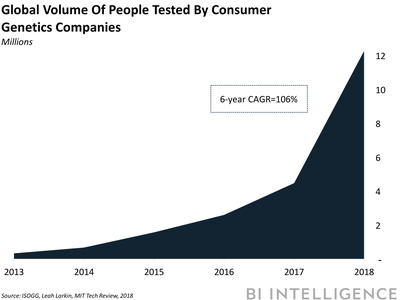 In 2017, the number of consumers who used a direct-to-consumer DNA test doubled, exceeding 12 million by the beginning of 2018, according to industry estimates. Data from DNA tests is incredibly valuable. With users’ permission, the data collected from home tests can be used by medical researchers and institutions for studies and research into things like population health and precision medicine. Moreover, being able to detect potential illnesses means clinicians can provide patients with precautionary care and recommend lifestyle changes that mitigate the risk of symptoms developing. Preventative care has the carry-over effect of helping to avoid costd associated with emergency care from chronic illnesses. The next big opportunity for consumer-genetics companies is getting employers to offer DNA tests to their employees via programs. This would help drive the next big wave of testing, leading to a windfall for the healthcare industry and DNA-testing companies alike. For employers, the tests could help catch diseases before they develop further, reducing the overall costs of employee health plans, which employers bear the brunt of, according to the Kaiser Family Foundation. PRE-OPERATIVE PLANNING IN VR GIVES SPECIALISTS AN EDGE: Specialists who review upcoming procedures in virtual reality (VR) are much more confident going into an operation than those using current standard volume-rendering software, according to results of a pilot study presented at the Society of Interventional Radiology on Sunday. Specifically, researchers from Stanford University found that giving specialists the ability to view and engage with 3D images of splenic artery aneurysms (SAA) within a VR environment gave them a clearer understanding of a patient’s unique arterial anatomy, which can help speed up the planning for a successful outcome. 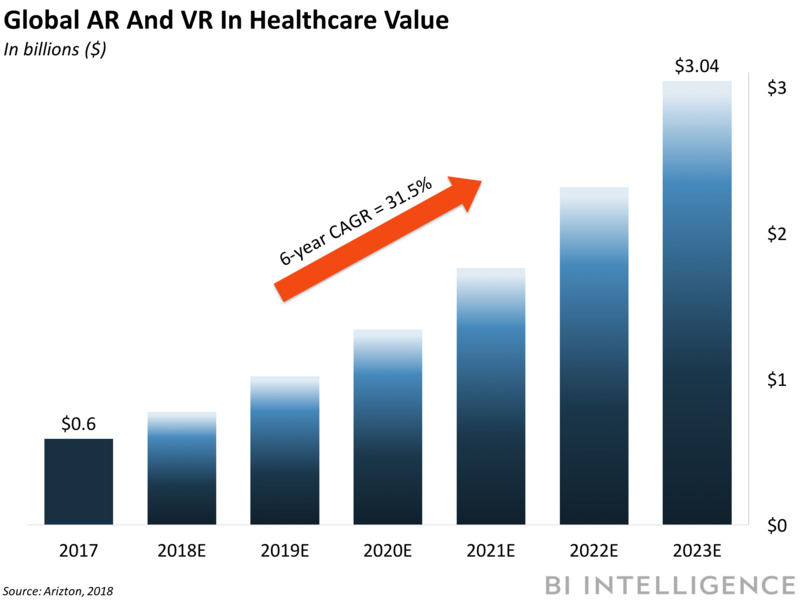 Although VR and augmented reality (AR) are a hot topic in healthcare, finding ways to use the technology have been less successful. However, that’s beginning to change as the technology finds its way into more procedures and pilot programs. For example, Texas surgeons recently performed the first sinus operation using AR, and in January 2018, a team from London used AR during reconstructive leg surgery, allowing physicians to see the patient’s bone structure and vital blood vessels during the surgery. As more instances of AR and VR are explored, the market for the technology is set to explode – by 2023 the global AR and VR in healthcare market is projected to grow at an annualized rate of 31.5%, surpassing $US3 billion in value, according to Arizton. Reset, an app developed by Pear Therapeutics to help patients modify their behaviour, is leading the charge in the prescription app market, according to The New York Times. The FDA approved the app for release later this year as the first mobile medical app to treat substance abuse disorders. The prescription app market, a part of prescriptive digital therapeutics, is set to shake up the pharmaceutical market, with some established pharma companies already taking steps to ensure they’re a part of the new industry – Novartis’ is teaming up with Pear Therapeutics, for example. Eden Health launched its personal health platform Tuesday that aims to simplify the healthcare experience for companies’ employees through telehealth and concierge services. Early access to the platform showed that companies offering the platform saw high employee engagement (60%) and a 10% reduction in healthcare costs. The tool is available in the Greater New York City and New Jersey markets with broader availability coming soon.